Whitewashing a vile opposition leadership for decades makes military invasion a possibility. “Venezuela opposition looks to military to oust Maduro. Dream on” says the headline to an article by John Otis in the Guardian. “Having failed to dislodge President Nicolás Maduro, the opposition is openly talking of a coup but mutual benefit links the military with the ruling party” reads the subheading. Otis cites opposition leaders Julio Borges, Maria Corina Machado and former Economist “journalist” Phil Gunson who is now with the International Crisis Group. 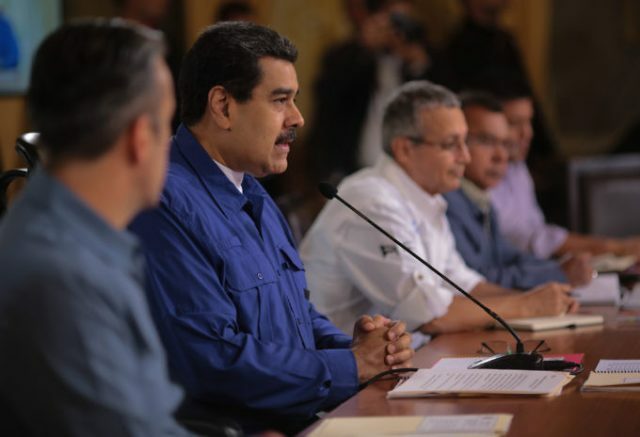 Borges and Machado, and the most prominent opposition leaders today (Henrique Capriles and Leopoldo Lopez) supported five different attempts to oust Venezuela’s democratically elected government by force. Otis doesn’t write a word about any of those attempts in his article. He thereby prevents readers from understanding why the opposition has suffered so many electoral defeats in Venezuela’s “chavista” era of the last 20 years. It has nothing to do with “undemocratic maneuvers” by the Venezuelan government as Otis suggests. In Otis’ own country, an opposition leadership like Venezuela’s – violent and foreign-funded – would have been immediately imprisoned and never seen or heard from again. The most successful attempt to oust Venezuela’s government by force was a military coup in 2002 that briefly succeeded. It ousted Hugo Chavez for 2 days. It was backed by the Bush administration and prominent US media. It was also supported, tacitly, by the Labour government of Tony Blair, a key contributor to war of aggression that killed hundreds of thousands of people, and a man whom the Guardian still makes periodic efforts to rehabilitate. The most embarrassingly supportive of the 2002 coup was the New York Times editorial board that gushed over Pedro Carmona, the businessman turned dictator who fired Supreme Court justices, dismissed elected officials, and annulled the constitution voters had ratified in a referendum. Phil Gunson, like so many other corporate journalists based in Venezuela at the time, parroted the opposition’s propaganda during the coup. About 60 Chavez government supporters who rose up against Carmona’s dictatorship were killed, not that the international media cared then or now. Those deaths are routinely ignored when the coup is mentioned at all. Months after that coup was defeated by a huge popular uprising among the poor, the opposition turned to massive sabotage of the oil industry that inflicted, at the time, the deepest economic downturn Venezuela had experienced in decades (until the current depression that began late in 2014). In April of 2013, after the presidential election that Maduro won, Henrique Capriles led violent protests that sought to overturn the results by force. Those protests led to the deaths of several government supporters. Early in 2014, shortly after suffering a big defeat in municipal elections, violent protests with the explicit aim of overthrowing the government were led by Machado and Lopez. They led to about 40 deaths; about half were government supporters, police or bystanders. In 2016, violent protests led to 120 deaths. To the extent the facts are known, it appears the breakdown of the deaths is about the same as in 2014, with government supporters, police and bystanders accounting for roughly half the deaths. The hubris of Borges and other leaders has been greatly exacerbated by the overwhelming support they have received from the US government, the international corporate media and prominent NGOs. Borges recently likened Venezuelan migrants to infectious disease. He has openly boasted in Venezuelan media, where he very regularly appears, of having success blocking the government’s access to loans. In other words, Borges has bragged about making an economic crisis worse, a tactic opposed by most Venezuelans according to an opposition aligned pollster – and essentially confirmed by recent election results. Otis’ article dismisses the Maduro government’s anti-corruption campaign, which has ensnared long time officials, as politically motivated. One can never discount political motivations in any government’s “anti-corruption” initiatives, but when perhaps the most brutal and backward government on earth, Saudi Arabia’s, launched a comically bogus “crackdown on corruption”, the Guardian published “news articles” that may as well have been written by the dictatorship. That these “news articles” brought no public protest from within the Guardian’s ranks, or resignations, speaks to how well-heeled and thoroughly “bought” liberal journalism is in the UK. Of course, hyping “reform” within Saudi Arabia has been done by the western media for several decades. The positive or negative press a government gets in the western media has nothing to do with its record on democracy or human rights. It has everything to with whether or not western elites view it as sufficiently cooperative. Prominent Venezuelan opposition voices are now openly advocating foreign military invasion. If it happens, reporters like Otis and outlets the Guardian should be held primarily responsible. Two decades of relentless demonization of a democratically elected government have been essential to making that crime a possibility.